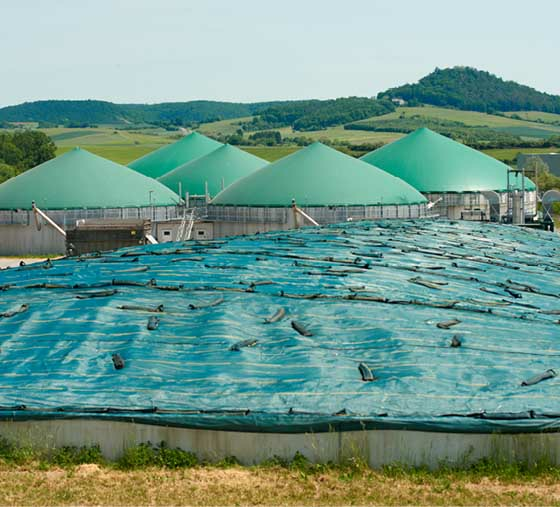 The biogas plant of Agrokraft Haßfurt GmbH & Co KG is just a stroll away from the Main. Mr. Scheithauer takes care of coordination and cooperation and can thus supply the most diverse regional facilities with energy. 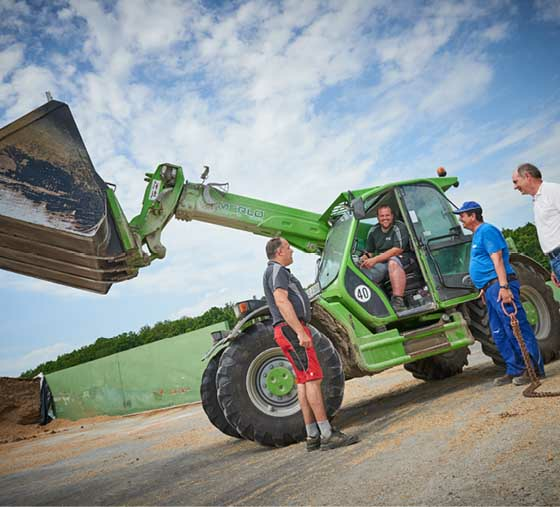 In 2010, the desire to secure sales of their landscape products and the sustainable use of regenerative heat brought the farmers from the region together with the local municipal utilities and so they founded Agrokraft Haßfurt. Today, a shoe factory, the leisure centre with swimming pool and the school centre are supplied with heat from the biogas plant. The operators rely entirely on the engine competence of 2G from Heek. Directly on the biogas plant an agent generates twelve-cylinder 450 kW, on each of the two satellite locations two agent six-cylinder 250 kW regenerative power each. 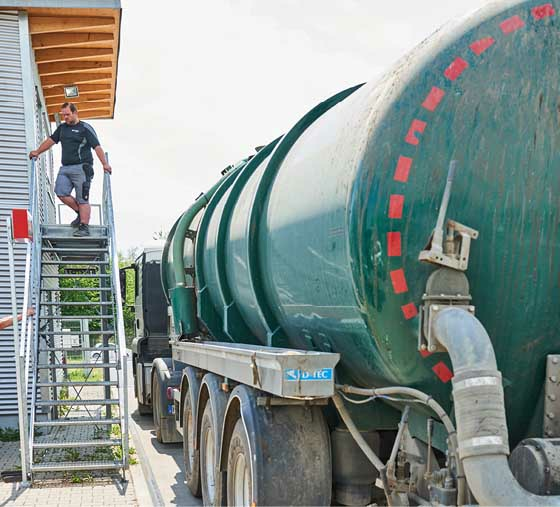 With 1450 kW electrical power, the biogas plant in Haßfurt is already one of the larger biogas plants in Germany. Managing Director Scheithauer has good news about the engines and service from Heek. “With 8,600 full-load hours per year, we are at the limit of what is technically feasible,” the operator sums up the successful past few years. 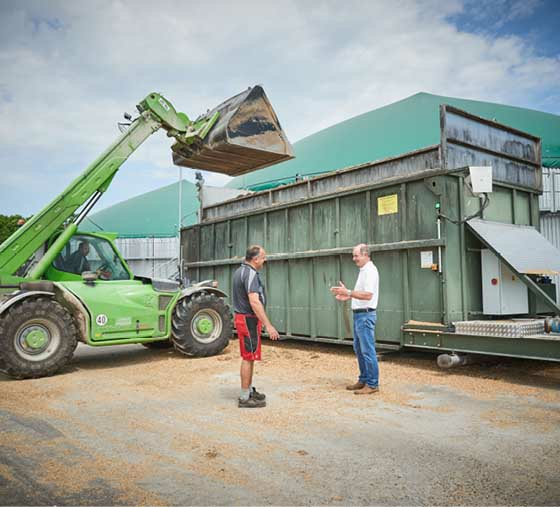 It is therefore not surprising that the shareholders are expanding biogas operation with a further 900 kW Flex CHP from Heek. In order to provide enough gas for the then available peak load of 2,350 kW, they are additionally planning an 8,000 m³ fermentation residue storage with a 3,000 m³ gas storage tank, which also gives them the possibility of storing their fermentation residues for up to 9 months. But that’s not all. In order to reduce the own electricity consumption of their biogas plant and to feed as much electricity as possible into the grid, the entrepreneurial operators installed another 73 kW photovoltaic system on the roof of the machine hall. Everyone is talking about sector coupling, which is already taking place in Haßfurt.